Obituary for Edith M. Evans | Hunter Funeral Home, Inc.
Edith M. Evans, 95, of Loraine passed away on Thursday, May 17, 2018 in Blessing Hospital in Quincy. Edith was born on March 29, 1923 in Rural Hancock County, Illinois to the late Hubert A. and Minnie (Newman) Staff. She married Robert E. Evans on March 6, 1946 in Fowler. Robert passed away on May 9, 2002. Surviving are; two daughters, Sharon Evans of Rochester, Carol (Timothy) Stevens of Victoria, British Columbia; two grandchildren, Brett (Amy) Bottorff of Loraine, Marcy (Eric) Seiz of Springfield; two great0grandchildren, Addison Bottorff and Averyawna Seiz; one brother Hubert (Debbie) Staff and numerous nieces and nephews. She was preceded in death by; one sister, Fern (Bob) Talcott and two brothers-in-law, Arnold (Myrl) Evans and Russell Evans. Edith was a member of the Loraine Methodist Church. 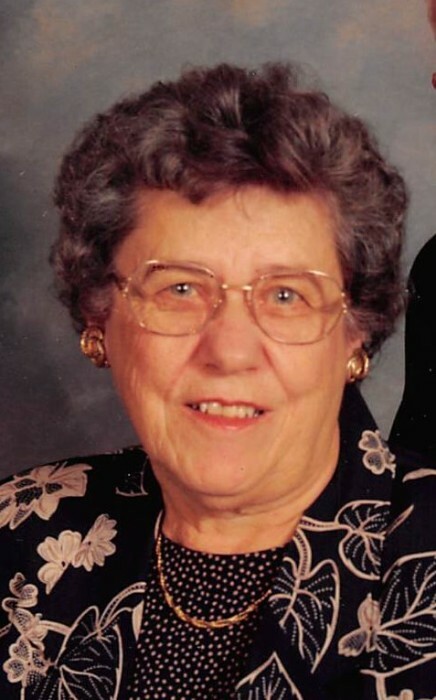 She enjoyed quilting, gardening, baking and was a very gifted seamstress. She especially enjoyed spending time with her family.